The First Anteroom - a small apartment of irregular shape, with a kind of screen pierced by an arch - serves to connect Cameron's central building with Brenna's rooms in the southern wing. The walls are decorated with white stucco-work: cornucopias, swags of flowers, rosettes, oval medallions with the figures of cupids, all beautifully set off by the light colouring of the walls. The fireplace faced with white and coloured marble is decorated with an over-mantel mirror in a luxurious carved and gilded frame. On the mantelpiece are porcelain vases produced in the second half of the eighteenth century at the Berlin and Ludwigsburg porcelain factories. The fireplace with its luxurious appointments, strongly contrasting with the austere style of the interior, effectively terminates the perspective which opens hom the Upper or State Vestibule. An important element of the anteroom's decor are two sculptured groups of patinated bronze: Jupiter on an Eagle and Juno on a Peacock, executed by Michel Anguier from the models of the Italian sculptor Alessandro Algardi, commissioned from him by Diego Velazquez who was acting for King Philip IV of Spain. Another remarkable piece of furniture was a secretaire of finely patterned burr with chased bronze ornaments and a Wedgwood bas-relief plaque depicting a classical scene. The secretaire is the work of Adam Weisweiler, a well- known French cabinet-maker. The range of apartments built by Brenna over the southern colonnade opens with The Second Anteroom. 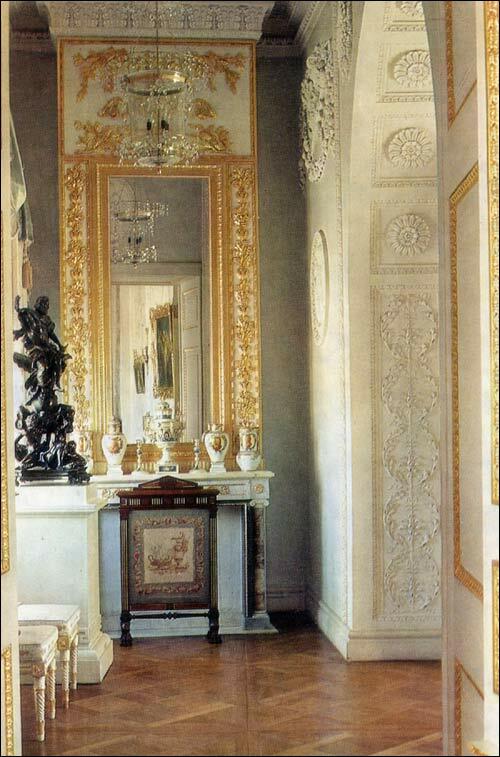 This anteroom and the similar Third Anteroom, situated at the other end of the curved Picture' Gallery, connect it with the adjoining apartments. The walls of the Second Anteroom are faced with stucco. The ceiling is painted in imitation of stucco mouldings set against a background of gold mosaics. " 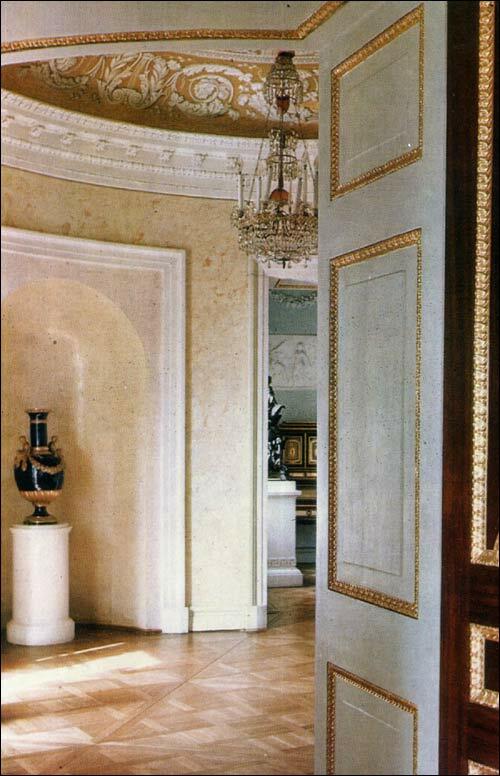 The niches in the walls are occupied by large porcelain vases made by the craftsmen of the St Petersburg Imperial Porcelain Factory as a gift for Paul I. The unusual shape of the vases, the dark blue colouring, and the graceful gilded figurines of infant satyrs holding wreaths of ivy create a striking decorative effect.